The Second Year Curriculum is organized to encompass the math strand (number, measurement, patterns, functions and geometry). At the start of the year, students review number concepts and (+) (-) math facts. Students discover patterns and devise strategies for committing the single-digit math facts to memory. In the third year, lower elementary students continue to expand on their earlier work. At this level, work typically includes the following concepts. Because our program is individualized, children who excel in math are given further problem-solving activities which will extend and deepen their understanding of the concept being taught. Children who may have difficulty in math are given extra help and guidance. The students examine concepts in many ways to provide an understanding of different learning styles. Our Language curriculum includes phonics skills, Word Study, Mechanics, Grammar, Reading Comprehension, spelling instruction, handwriting and writing applications. Students use manipulatives to enhance the learning experience. Every lesson incorporates and builds upon prior skills learned collectively in each of these curriculum areas. Each new concept is introduced with a “Key Experience” which uses objects to enhance the initial impression. The child then works independently with hands-on materials to master the concept. Grammar is introduced through these Key Experiences and is accentuated by color-coded symbols that represent the various parts of speech. The practice of symbolizing parts of speech includes both paper-pencil work and manipulative exercises. Grammar is introduced in the first year and is reviewed and built upon every year after. Word Study includes learning about compound words, synonyms/antonyms, prefixes/suffixes, homonyms, homophones, homographs, masculine and feminine, and correct expression. Vocabulary is greatly enriched as students are introduced to these terms and investigate their meanings and usage. Mechanics is the correct use of capitalization and punctuation. These rules are taught in meaningful contexts: for example, letter writing, dialogues, poetry and research. Reading comprehension is strengthened through the Accelerated Reader Program, SRA, reading groups and teacher-led discussion. We employ the Handwriting Without Tears Program to hone our students’ manuscript and cursive writing skills. Science. Our elementary science curriculum is quite involved. 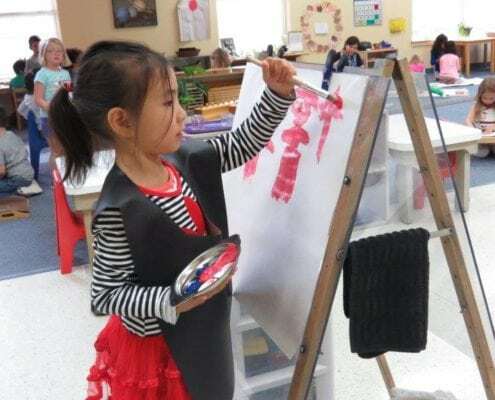 At the Lower level, the Montessori curriculum, covering Botany and Zoology, emphasizes the external characteristics and classification of plants and animals. Botany. The students enhance their knowledge through experiments and the presentation of representative plants. The study of Botany ties into Geography through research of native plants of various regions/continents. Activities include care of plants in the classroom and outdoor gardens, propagation of plants via seeds, stems and roots and the inclusion of literature. Zoology. This curriculum encompasses an overview of the animal kingdom and each phylum, with a more detailed study of each phylum including fish, amphibians, reptiles, birds and mammals. We also explore animal needs and how they are met. The children study vertebrates and invertebrates, observing live animals in the classroom whenever possible. The second and third level students work on their research skills by researching different animals. Throughout the year, the children are engaged in different zoology projects, furthering their development and understanding of our zoology curriculum. The Lower Elementary Montessori science curriculum is also enriched with the FOSS (Full Option Science System) curriculum, which presents physical science concepts and related experiments. History. At the Lower Level, the Montessori curriculum begins with the notion of time, including the calendar and the clock. The Montessori Great Lessons introduce students to the creation of the universe, which then leads to an in-depth study of the timeline of life. Lessons involve the students in ways that allow them to gain perspective into the role of human beings on Earth and the fundamental needs of all people. Lower Elementary students engage in research regarding all these topics, as well as the study of United States history and government. Geography. At the Lower Level, the students are introduced to the nomenclature work that makes up our curriculum. The children learn about the parts of the earth, a mountain, a river and begin to research the connections between these concepts. We then move into continent studies. Each year, two to three continents are studied. The children experience these continents through literature, research and projects. After studying the continents, the children will have a greater appreciation for the many cultures that make up our earth.